Turn your AK or SKS into a fearsome deer rifle with these 7.62x39mm cartridges from Hornady. 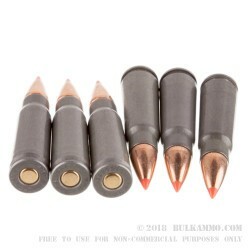 This ammunition features the SST bullet, a polymer tipped hunting projectile designed for maximum efficiency. The SST has a highly aerodynamic profile and a boat tail and delivers excellent medium-range accuracy; upon contact with the target, the polymer tip crushes into the expansion cavity and causes deadly mushrooming. A locking band secures the bullet jacket to the core and ensures good weight retention. Each cartridge in this case of 500 fires a 123 grain version of the SST at a muzzle velocity of 2,350 feet per second. These rounds use non-corrosive Berdan primers and steel cases with polymer coatings for reliable cycling. Though not reloadable, steel cased ammo is what the AK and SKS were designed to operate reliably with, and it provides a highly cost-effective alternative for hunters. This ammunition is loaded at Hornady's headquarters in Grand Island, Nebraska. A: Hello! 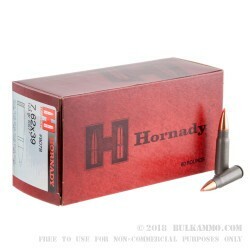 This Hornady ammunition is loaded with a standard copper jacket, lead core projectile. This ammunition contains no steel and will have no issues passing any magnet tests.